While a couple suburbs fight to keep their bids under wraps, we have a first glance at incentive deals packaged by Richardson, McKinney, Carrollton, and more. After Amazon announced where it was putting its new headquarters, Dallas pretty quickly let us know how much money it had offered the company for the honor—$600 million, to pair with the state’s $500 million. But some of you wondered why you weren’t getting let in on the incentive packages put together by the suburbs, which was a fair ask. After all, the Dallas Chamber of Commerce compiled a joint list of dozens of sites across North Texas. The short answer is that these cities are going to handle this stuff their own way, and some of them are fighting the public’s right to know. They use as a defense that revealing the specifics of their big money offers will hurt their chances to pull in the next big corporation that sniffs around. If a municipality doesn’t willingly release its offer to the public—a la Dallas, Fort Worth, and Arlington—the process to get your hands on it is to submit an open records request asking for the documents. We submitted requests to a couple dozen suburbs asking for their incentive packages. Many of those places got back to us saying they never submitted an incentive package—or bid—at all. Three big ones that did submit bids would not give up the docs. Irving and Frisco each requested a ruling from the state’s Office of the Attorney General—those are pending, and the AG has 45 days to respond. Meanwhile, the city of Plano had already requested a ruling on a different open records request for the details of its Amazon bid. On that request, the AG ruled with the requestor in saying that Plano must release the documents. Plano turned around and sued the AG to keep the docs sealed, seeking “to prevent competitive harm to the City’s efforts to retain and recruit businesses to the City.” That’s where the thing stands today. By the way, if all of this was sounding vaguely familiar, it’s because that other request—now pending in court—was sent from within this very office. Our Peter Simek tried to get his hands on a half-dozen incentive offers toward the beginning of the year. As he pointed out in the resulting piece, it was an even tougher task prior to Amazon’s eventual decision. If you’re keeping score, we’re now awaiting another AG ruling with regard to Plano’s bid—on that, 45 days would be April 2—in addition to the pending court case, which is on Lord-knows-what timeline. Other cities complied with our records requests and sent along the information. What we have below, then, is a roundup of the incentive packages we know about so far. Dallas: See our story here on Dallas’ incentives, which totaled $600 million. Arlington: See our story on Arlington’s bid, totaling $921 million. Fort Worth: Cowtown offered incentives worth $443.2 million, almost entirely through a property tax rebate program. Basing their numbers on an investment from Amazon totaling $3.85 billion ($600 million during phase one, $1.26 million during phase two, and $1.99 million during phase three), rebates would’ve reached $438 million. The other sliver comes from development fee waivers—$1.5 million—and a $3.75 million Enterprise Zone nomination. Although the city didn’t include this in its public announcement about incentives, documents show Fort Worth was also prepared to sell Amazon city-owned land on Panther Island at a discounted rate—pending approval from the Trinity River Vision Authority, which has oversight of that development. The city marked that it was 75 percent sure it could get the approval it needed to discount the land, although it didn’t provide an estimated value of the discount. Fort Worth also offered a few additional incentives for which it didn’t assign a dollar amount, most notably related to travel. Amazon employees would’ve gotten discounted airfare, dedicated services, and a check-in station at DFW International Airport. Lewisville: The northwest suburb had a couple of sites picked out for the mothership—a Bright Realty Company-owned slice of 108 acres where Sam Rayburn splits in the eastern part of the city, and a 221-acre property owned by Accelerated Christian Education in the southeast portion. Lewisville’s incentive package totaled $292.2 million, including $264.1 million from a real and business property tax abatement plan, $25.7 million in hotel occupancy tax breaks, and $2.3 million in forgiven permit fees. The city also planned to give Amazon a grant to cover 100 percent of the construction sales tax for the project, which was not factored into the $292 million figure. 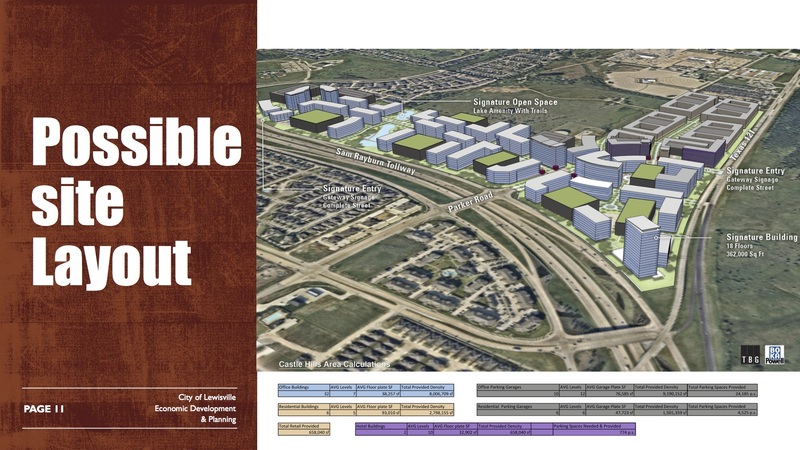 Lewisville proposed 32 buildings, including roofs in Amazon green and a lake and trail amenity, here at one proposed site on the east side of town. Carrollton: Carrollton, which borders Lewisville, also had two sites picked out, and the total incentives were contingent on which one Amazon would’ve settled into. Had it picked Austin Ranch, at the north point of town, the incentives would’ve totaled $370 million—including a 15-year property tax rebate worth $350 million, a permit/impact fee rebate worth $15 million, and a jobs grant worth $5 million. Had Amazon selected Trinity Mills, in the center of town, the jobs grant would’ve been replaced by a $25 million land subsidy, bringing the total incentives to $390 million. Richardson: Richardson got creative. The bulk of the $345 million incentive package it put together came from something they termed a “Plano ISD Tax Value Limitation—Ch 313.” Under Texas Tax Code, Chapter 313, a school board can vote to temporarily limit the taxable value on certain new investment projects as a way to incentivize development, as long as the Texas comptroller signs off. Richardson valued the limitation at $220 million over 10 years, and put its odds of securing the needed approvals at 80 percent. 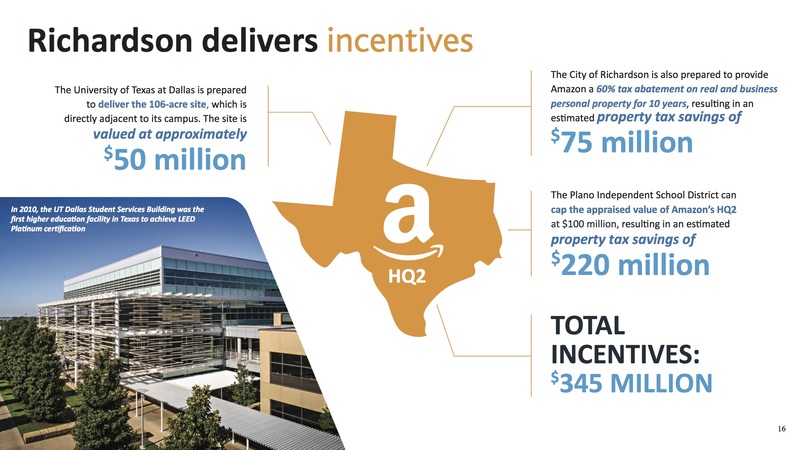 “Plano ISD has entered into such agreements in the past and is open to discussing, subject to school board approval, with Amazon a similar agreement,” reads a Richardson incentive summary sent to Amazon. Plano ISD has one such active agreement: with a Texas Instrument facility dating to 2005, limiting taxable property value under the district’s maintenance and operations tax to $100 million. Richardson was going to sweeten the pot with property tax rebates worth $75 million over 10 years. And then there’s this: the city told Amazon that The University of Texas System was “prepared to deliver 106 acres of its UT Dallas land adjacent to the existing Richardson campus,” a value of $50 million, spurring a partnership that would “result in student scholarships, innovative research opportunities, endowed faculty chairs, and investments in the next generation of urban learnings labs and talent development.” It would have needed approval from the UT Board of Regents, and Richardson said it was 80 percent sure it could get it. A key piece of Richardson’s presentation was the connection to UT Dallas. McKinney: The offer here was for $450 million to $475 million over the life of the $5 billion, 15-to-17-year investment that Amazon spoke of in its request for proposals. The money would have come via a Tax Increment Reinvestment Zone (TIRZ), a grant from the McKinney Economic Development Corporation and McKinney Community Development Corporation, and additional cash grants from the city. There’s no indication as to the proportions of each of those mechanisms. Denton: Including Denton here for now, although we’re seeking additional documentation to try to get a number to put to the total incentives. For now, we know the far northwest suburb had three sites on the table: Cross Timbers, Hickory Creek, and its downtown innovation district. There were varying degrees of city and county tax abatement up for grabs, a TIRZ that would’ve saved Amazon money at the Cross Timbers site, and a Denton ISD value limitation similar to the one Richardson was offering through Plano ISD. Denton would also have given up sales tax rebates for construction up to $10 million and a city rebate grant that could’ve added another $10 million.